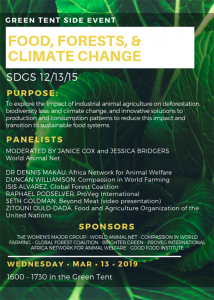 Brighter Green is partnering with World Animal Net, Compassion in World Farming, Africa Network for Animal Welfare, Good Food Institute, Women’s Major Group, Global Forest Coalition, and ProVeg International to host a side event on Wednesday the 13th from 16:00-17:30 called “Dialogue on food, forests and climate: SDGs.” The goal of this side event is to explore the need for a shift in food production and consumption patterns (SDG 12) in order to mitigate climate change risk (SDG 13) and protect forests and biodiversity (SDG 15). 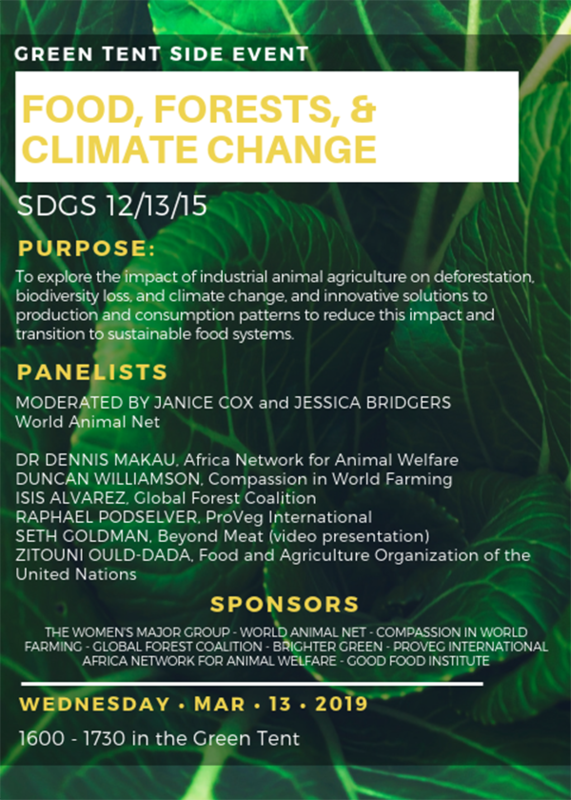 Panelists will explore the ways in which current food production and consumption patterns are contributing to climate change and driving deforestation and biodiversity loss, as well as present demand- and supply side solutions, including innovations in marketing, policy, and technology. 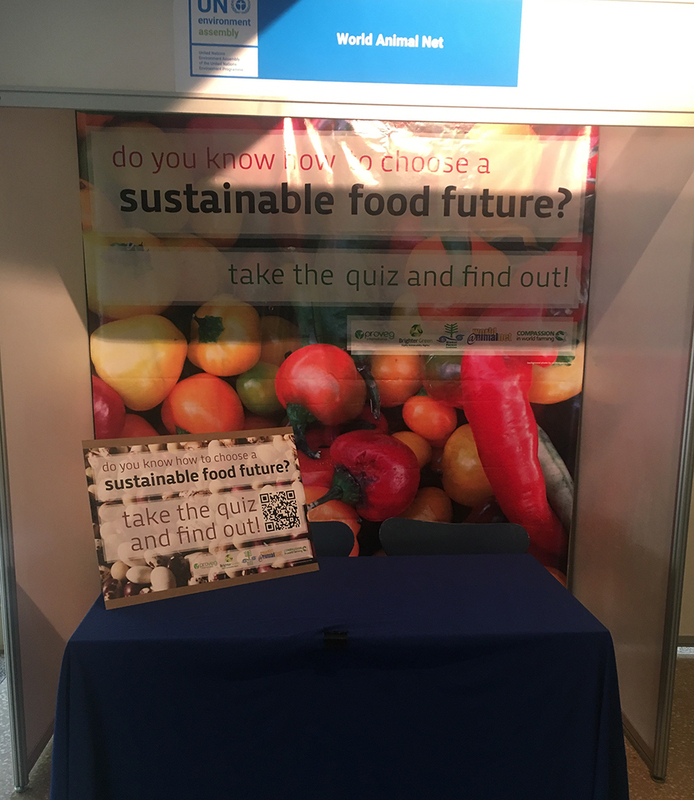 We are also sharing a booth with these nonprofits and are encouraging everyone who stops by to take the Sustainable Food Future Quiz. 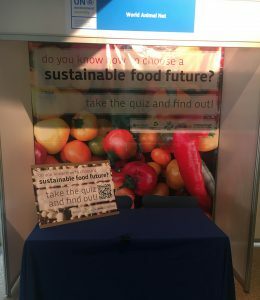 We want to see if people know how to choose a sustainable food future. This quiz will also help to spark conversations around food, animals, and the environment, and see where people may be lacking information on these topics. In addition, Food and Climate Research Network member Peter Stevenson of Compassion in World Farming has produced a policy briefing for UNEA-4, arguing that industrial livestock production has a detrimental impact on soils, water, biodiversity and food security and also undermines small-scale livestock farmers. Read the full policy briefing, Sustainable food systems, food security and halting biodiversity loss—Food and farming: the need for an innovative approach, here.